Sukorn Island (Koh Sukorn) is situated in Palian district, Trang province. For this project, we will be conducting activities with communities in Baan Laem and Baan Toong village (2 on the 4 villages of the island). In these 2 villages, there is population of 1,189 or 337 families, 95% of them are Muslims. On this island there are also official offices and institutions of which are government-run namely one pre-school, two primary schools (grade 1 to grade 6), one healthcare center and one police station. 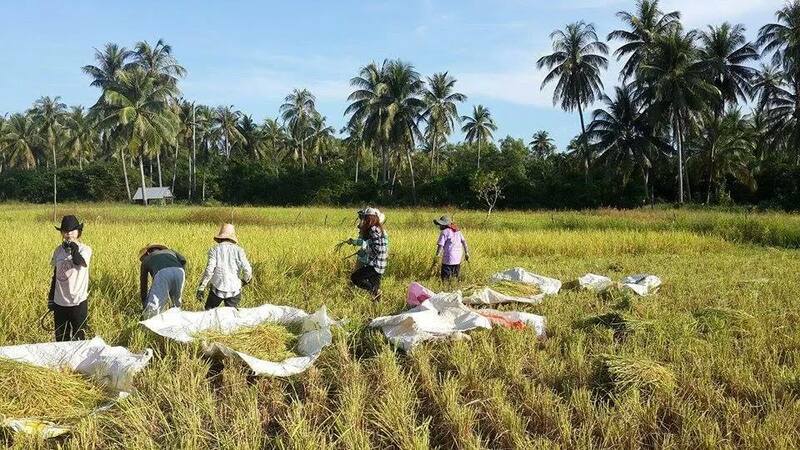 General income of villagers is from fishing industry regarded as main occupation, secondly is rubber plantation and agriculture; growing rice, watermelons, corns and other seasonal vegetables as well as keeping livestock. KohSukorn watermelon is widely well-known for its best product because of its sweet juicy taste. The island landscape is geologically plain, partly with small hills. Also, around the shore line, it is lined up with scattered mangrove trees. In general the villagers are very generous and they still remain the culture of supporting and sharing with each other. Furthermore, they also believe that paddy and agriculture is the main food stability of the village. Already some years, a group of local researchers have been working with the 2 communities mentioned above. In one community, the village members are still remaining their traditional way of living, while in another, people started to drop their old values and turning to development from the cities. Less and less people are working on paddy fields, or growing their own food supply as it is easier to buy. 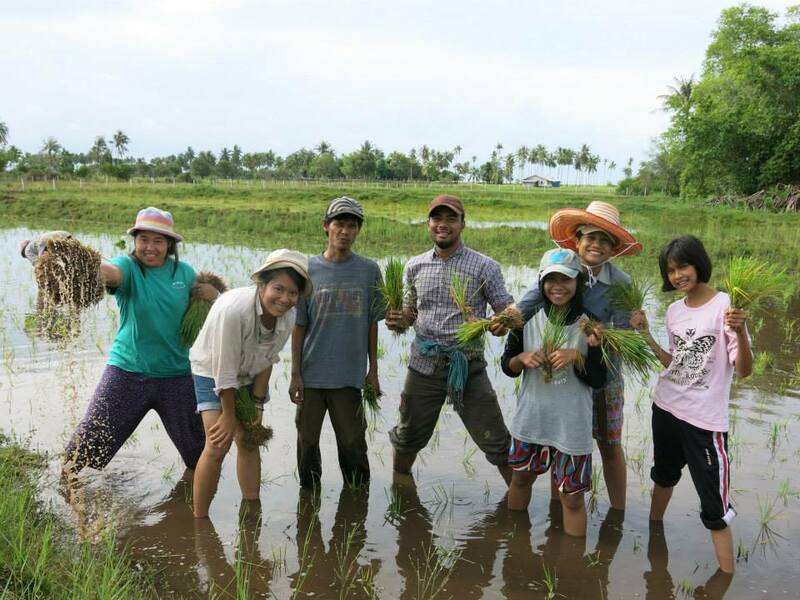 Therefore, these researchers aim to bring awareness to the locals to keep their life style and revive the tradition of growing paddy, other traditional agriculture, as well as developing local rice species, and forming farmer’s co-op group. They invite us to organize volunteers’ activities there in 2013. Few years after, the researcher group is not very active anymore but we have successfully continued activities (mainly agriculture and activities with kids) with villagers and develop good relationships through short term workcamps and middle term volunteers. The period is now (since 2016) fixed from August to March as the raining season from April to July has less possible activities for volunteers. It is also important the host family have some time for themselves. Volunteers will be staying together with a host family and share the daily life with them. They will mostly join agriculture activities but may be organizing activities with the local kids. Their place in the daily life of the host family is essential. They shouldn’t be a burden but a support which can easily be spread to the community around. Since 2016, all the middle term volunteers were staying at JaTak and Bang Meng family and their experience has been really great. Ja Tak would take time every day to explain them what they can help or do. Both hosts are going every morning from dawn to beginning afternoon for fishing but they still have enough energy to do more activities with volunteers after this. There is another family, Ja Yao who is also ready to welcome volunteers. August and September September is the starting month of rice planting season. 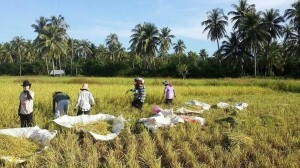 Traditionally, villagers will prepare their best-selected paddy. The second step is to sow the fertilized paddy into nursery fields. Thirdly, plough the soil for transplanting the rice. **Every year at the end of December, a special annual event will be organized at the island. People know it as “Bergfah Andaman Festival”. This festival is held widely in famous places located in the Andaman Sea. The aim is to promote products made by locals. There will be booths set up in which villagers sell food and sweets, and friendship activities like boat racing, football matches against village teams as well as performances on stage will be also held. The volunteers either share one hut either sleep inside the house. There will be simple mattress, pillow and mosquito net. You will need to bring sleeping bag. Volunteer will be part of the family who will take care of them for everything including food, security and transport. You will join daily tasks for collecting food and cooking. Local people eat rice (or noodles) 2 or 3 times a day with side dishes like curries, omelets, local leaves and vegetables and many fishes and sea food. Because the family is Muslim, there will be no pork or alcohol. Internet/phone access: You can use Internet mobile phone sim card..
Hat Yai, the main city of South Thailand (close to DaLaa office) is about 4 hours by public transport from Koh Sukorn. The volunteers should be ready to stay in a remote area, to adapt to the local conditions with only basic facilities and with few people able to speak in English. Volunteers should be able to handle spontaneous working environment and constant changes in the plans. The mentality and way of thinking is very different from the western world. There may have activities with the children. To have responsibility for yourself, the kids and full involvement in community matters is a must.